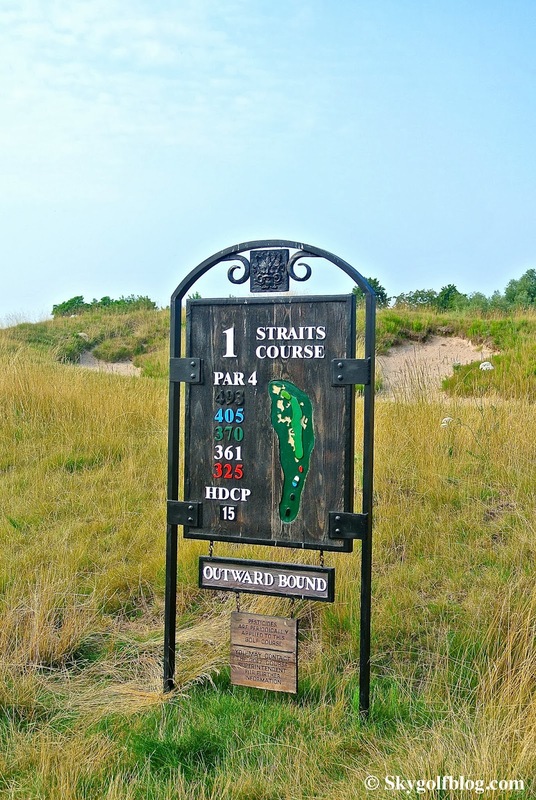 The Straits Course is the fourth and last course of my Midwest Swing itinerary. Driving North from Erin Hills through the city of Sheboygan, among farms and acres of cornfields, it is hard to imagine how this place rapidly became one of the premiere golf destinations in the country, and home of #2 Greatest Golf Course in the US. On a two lane road with nothing and no one around the GPS advises me only one mile is missing to reach the destination. I am thrilled, excited. Coming from the other side of the Ocean, being there is a true honor and privilege for me. I can't stop thinking of the 2004, 2010 and 2015 Pga Championship, the 2020 Ryder Cup, Dustin Johnson's bunker on the 18th hole, unforgettable and memorable moments on one of the greatest links style course in the world. The last turn and...a there I am!! The famous logo recalling one of the greek god winds (and maybe Herbert Kohler's face) welcomes me at the gate. Slowly I enter the property, with feelings of respect and adoration for the place. And the surrounding panorama changes all of a sudden!! I'm not in Wisconsin anymore...a piece of Scotland is in front of my eyes!! A unique place that in just 15 years strongly entered in the history of the game. "I should say this with some degree of modesty. In my lifetime I've never seen anything like this. Anyplace. Period". This what Pete Dye, the renowned course architect, said describing his masterpiece. Everything started with the idea of local multimillionaire Herbert Kohler, and Kohler Company CEO, of building a new legendary golf course to be included on his American Club Resort. American Club Resort with its four courses is one of the best US resorts for golf and today one of the top destination in the world among golfers (on the 2013 Golf Digest Top 36 golf destinations Kohler and American Golf Resort are ranked #4 behind Scotland, Oregon and Monterey). Kohler acquired in the late 90's 560 acres of land along two miles of shoreline of Lake Michigan, a formerly flatland military base. He hired Pete Dye, who also designed the Irish Course in Whistling Straits and the River and Meadow Valleys courses at Blackwolves Run, to give life to one of the greatest golf courses on earth. And what he did with that piece of land is amazing. A flatland totally redesigned. Dye created dunes, hills, slopes and bunkers everywhere, at least a thousand maybe more. He gave a new shape to the property bringing in more then 800,000 cubic yards of sand and dirt. That's more then 13,000 truckloads. He designed the course inspired by the classics links of Scotland. And the result is impressive. Eight holes play along the lake, including all the four par threes, two of them running from north to south and two from south to north. Lake Michigan can be seen from every hole. So beautiful and so challenging. A beast of 7,790 yds from the black tees (77,2/152) and 7,142 yds from the blue tee (74,2/142), that is able to worry the best golfers of the planet even with no wind (typical of the zone as the name suggests). Whistling Straits opened for play in 1998 and in the recent years already hosted two Pga Championship (2004, 2010) and will again in 2015. And its fairways will be again walked by the greatest players in 2020 for the Ryder Cup. Playing the Straits Course is pure golf, unlike any other course I have played. The course is walking only, and caddie is required and even if the cost of the green fee is substantial, it is an experience that every golfer should have at least once in the lifetime. And an experience not be to missed after your round is visiting the stone clubhouse, a celebration to the traditions of the game, offering breathtaking views of the 9th and 18th greens and Lake Michigan in the background. NEPCO Lake was built in the 1920s by the Nekoosa Edwards Paper Company (NEPCO) to provide ultra clean water for making white paper. NEPCO Lake was built using horse drawn wagons and tractors. More than thirty teams of horses were used at any given time. To this day water flows out of the lake into a pipe...it is then pumped south of NEPCO Lake all the way to Nekoosa, WI where it is used to make white paper. This water is REALLY clear.